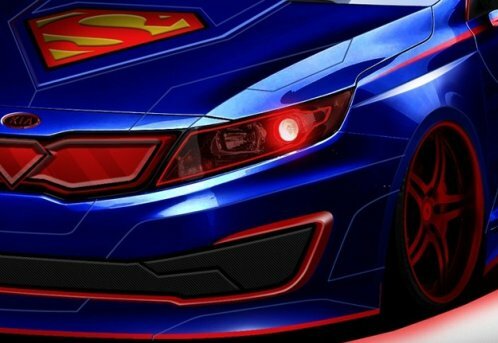 Details on the Superman Kia Optima Hybrid sedan being unveiled at the 2013 Chicago Auto Show are limited but the teaser image introduced by the Korean automaker offers a good look at what to expect. In addition to the blue paint scheme with red accents on the grille, on the lower front fascia, on the body side stripes and in the wheels, the Optima Hybrid will wear the familiar Superman “S” logo on the hood. The unique red grille has the basic design of the standard grille on the Kia Optima Hybrid but the shape of the Superman crest has been integrated into the middle of the grille. The teaser image also shows what looks to be red headlights surrounded by red LED trim lighting while the eerie red glow along the bottom of the car suggests that – like other superhero Kia models – the Superman Optima Hybrid will be underbody lighting. In addition to the unique color scheme, the Superman Kia Optima Hybrid will likely feature an aggressive one-off body kit, massive aftermarket wheels and a suspension package to slam this super hybrid sedan to the ground. The teaser image shows a front fascia that differs greatly from what comes on the standard production version of the Optima, especially with the dramatic chin spoiler that looks like it wil hover just inches from the ground. The 2012 SEMA Show brought us the formal introduction of five Kia show cars based on their partnership with comic book publisher DC Entertainment. This included that Batman Optima, the Aquaman Rio, the Green Lantern Soul, the Flash Forte Koup and the Cyborg Forte sedan. Along with the Superman Optima Hybrid, these vehicles will be used as show vehicle in the "We Can Be Heroes", DC Entertainment's charity campaign that is working to families affected by the drought and famine in the Horn of Africa. The Batman Optima and the Green Lantern Soul were also in attendance at the 2013 North American International Auto Show earlier this month in Detroit’s Cobo Hall. While these Justice League Kia models featuring some of the best known comic book superheroes of all time are too ridiculously elaborate to ever be considered for production, these hard to miss show vehicles have drawn and will continue to draw a ton of attention at shows around the United States – all the while raising awareness for the DC Entertainment We Can Be Heroes charity. Having had the pleasure of seeing the other Justice League vehicles in Vegas and in Detroit, even though I am not a comic book fan, I can attest that these are some cool show cars for a great cause. Stay tuned to TorqueNews.com for all of your automotive news including coverage of the upcoming 2013 Chicago Auto Show!